The B3 Spectroscopic sCVD Diamond Detector is made for high-precision spectroscopy with charged particles and neutrons. It has a compact PCB design with extra RF shielding. The active measurement area is 10 mm2. This detector can be operated in vacuum. The B3 Spectroscopic Diamond Detector is optimized for the detection of α-particles and heavy ions. The substrate properties assure good γ-background rejection. The thickness of the diamond sensor can be custom specified. In combination with the Cx Spectroscopic Shaping Amplifier the B3 Spectroscopic Diamond Detector is optimized for high-precision spectroscopy with low noise. 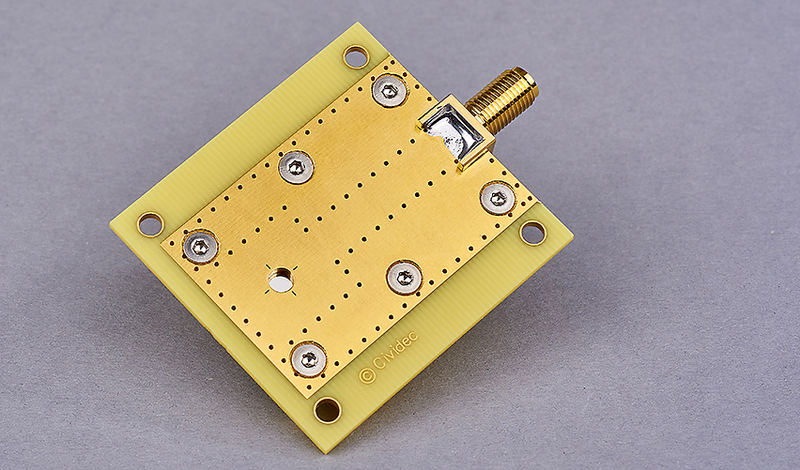 In combination with the Cx-L Spectroscopic Amplifier it is possible to attach a 2 m long cable between the detector and preamplifier, as used for measurements in vacuum and cryostats.